Students who excel in a particular field should be recognized and honored for their success. Honor cords from Honors Graduation are made from high quality synthetic material, and will last long after your graduates have received their diplomas, ensuring that they have a small treasure to remind them of their educational journey. Graduates who are members of the Pi Kappa Lambda National Music Honor Society are sometimes given permission to wear gold and white doubled honor cords for their commencement ceremonies. A doubled honor cord is comprised of one gold cord and one white cord. Be sure to check with school administrators and your local chapter of Pi Kappa Lambda for detail about how your gold and white honor cords should be worn. Your student upholds a long standing tradition of honor and excellence, maintaining incredibly high academic and muscial standards. As the highest caliber musicians and academics, your graduates have worked hard to earn their place in the music world. By extending to them the option of an honor cord to wear across their shoulders at graduation, you are inviting them to continue in excellence through the rest of their lives by acknowledging their past and present success. Honors Graduation does not offer cords directly from the Pi Kappa Lambda society. 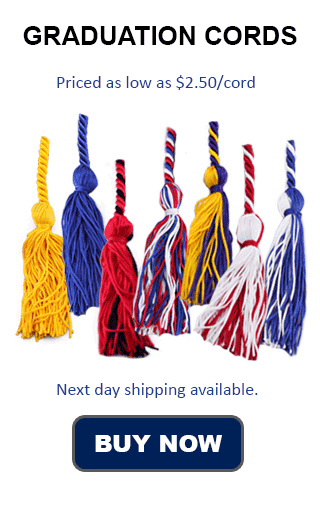 However, since the Pi Kappa Lambda website does not carry honor cords for sale in an easily accessible store on their website, we offer the same colors and highest possible quality for a great low price. Make sure your top performers are given the chance to shine at their commencement ceremony by bestowing upon them the honor of wearing gold and white graduation cords. Our gold and white honor cords are sure to look sleek and academic against the black traditional robes of graduation. Gold and white honor cords are the perfect way to acknowledge your graduates' individual talents and abilities, and can serve as encouragement in all their future endeavors. As a symbol of both academic and musical prowess, our gold and white graduation cords are the perfect finishing touch for your commencement exercises, and, by request, may come already tied together for your convenience.